My biggest boy doesn't feature so often on the blog anymore, partly because he is now at school 5 days a week and partly because he often wants to be bribed to take part in any photos. I have been wanting to talk about dressing him though, because as he is getting older I am aware that his style needs to grow with him. Dylan is 6 and he is far from a toddler. Some of the bright prints that I love for Finn no longer suit him, yet often I find clothes in his size are plain and grown up and don't reflect the colourful boy I know. It took me 2 days to find a coat for school that I felt fit the middle ground for us. 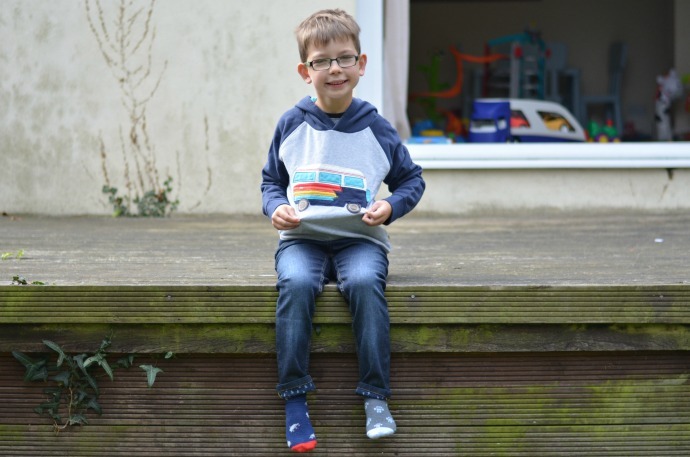 Frugi is a brand I have bought for the children in their baby and toddler years and then forgotten about, but when they asked us to pick something for Dylan instead of one of the younger children it gave me a chance to really check out their older ranges. As it turns out, this is where I should have been shopping for him all along! 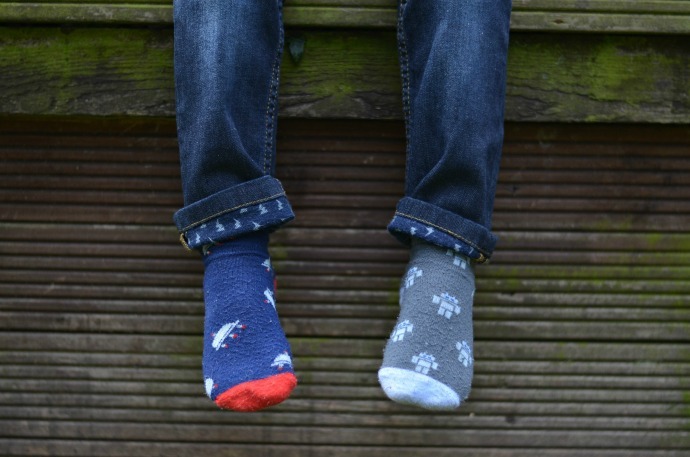 We chose a pair of jeans and a hoody as winter is fast approaching and as with all the Frugi clothing, these are designed in the UK and made of ethically sourced organic fabric. The jeans have just the right amount of stretch, an adjustable waist and a lightening bolt print on the inside that makes them more than just your average jeans. We are so impressed with the quality and the fit and I loved the playful touch. Dylan finds them really comfy and will reach for them over his other jeans. No amount of bribery could persuade him to wear shoes of course. 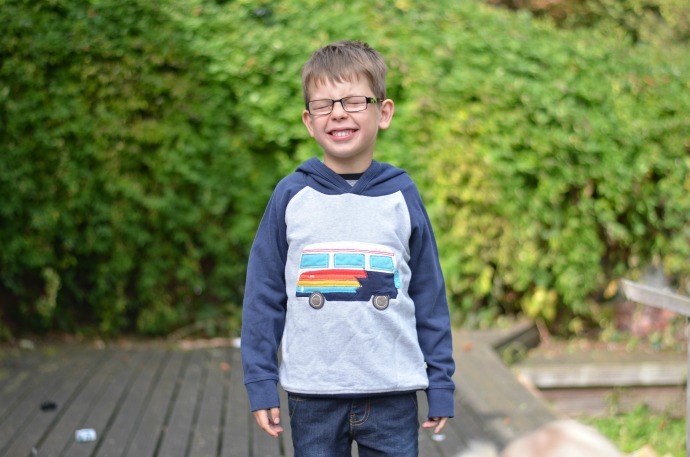 I chose the campervan hoody as I thought that the blue and grey colours would go with everything, but the rainbow stripes on the campervan make it stand out and instantly look more colourful. The hoody looks really comfy and Dylan loves wearing it. 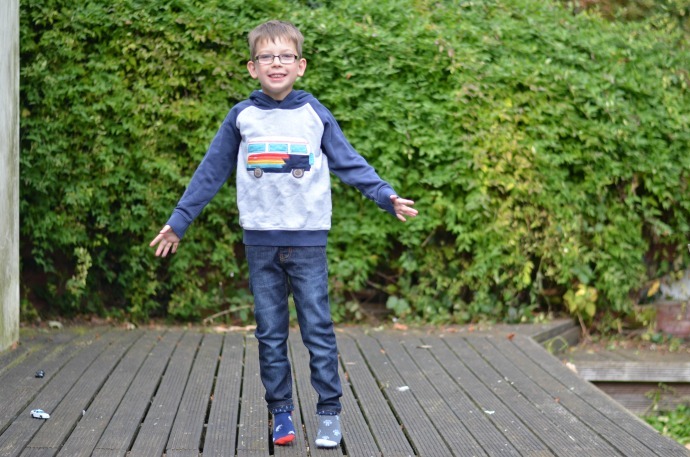 We went for both items in age 6-7 knowing that Frugi come up big an they fit perfectly even on my very tall 6 year old (he is roughly 128cm tall). This gorgeous outfit suits your boy so well; it's just colourful enough to be fun whilst being grown-up enough to suit his bright, insightful, serious little personality. Fab choice! I love that Frugi will grow up with the boys.